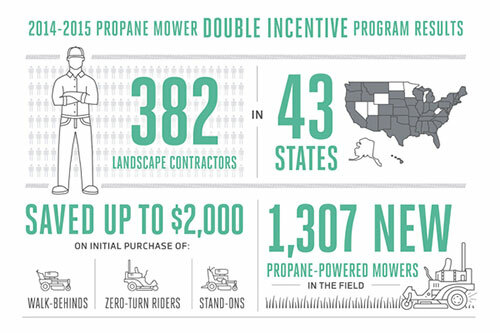 The Propane Education & Research Council (PERC) approved 1,307 Propane Mower Incentive Program applications from Oct. 1, 2014 to March 21, 2015, a six-month period in which the organization doubled incentive allotments. During the double incentive period, landscape contractors could receive $2,000 incentives for each new propane mower purchase and $1,000 for every qualified conversion. Over the six month double incentive period, the 1,307 applications were submitted by 382 landscape contractors in 43 states. Since the program launched in 2012, a total of 2,941 applications have been submitted.